BT-AH VM(R) series slurry pumps are heavy duty, vertical, centrifugal and could work to be submerged in the sump and pool. These pumps don’t need any shaft seal and sealing water, which could work normally even if the suction volume is not enough. The pumps are of singel casing structure with the advantages of light weight, small volume, easy installation and maintainance. . 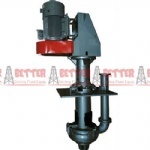 The pump casing of type BT-AH-VM(R) pumps are made of wear-resistant metal and the impellers are made of wear resistance metal or natural rubber, polyurethane and synthetic rubber. According to the different lever of liquid slurry in the pool, the different shaft length and suction pipe size could be selected. They are designed for pumping the slurry at abrasive, large particle and high concentration. Drive type could be DC(directal connection), V belt drive(CL, CR, CV, ZV), gear box reducer drive, hydraulic coulpling drive, or other as per the request. Please consult with our sales for further inforamtion. HERE for catalogue!